One evening I watched a small spider swinging in the breeze out of the huge old fig tree at the bottom my garden. Then it just landed on another tree with its web attached. From there it climbed back up its thread to the first point and fastened again, and dropped again to the other tree. This process continued while it finished the main spokes of his web. It climbed to the middle, and started completing its web by attaching radius connections. These little insects are quite amazing to watch. Just one single thread and the risk of launching from a branch, forms the basis of this intricate web. I was reminded of my childhood days and riding on horseback through some scrub country after cattle. Inevitably there were many spider webs as they easily string their webs between the scrub trees. I hated the sticky webs of the big cross stick spiders, as they clung to skin. I would grab that web off my face hoping there wasn’t a spider. I realise from a little study that the spider would intuitively know not to come when something big ran into its web. I still would not hang round to find out! 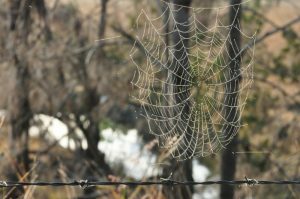 The actual completion of the web is far more intricate and clever than what appears to the naked eye. The spider easily grips the thin threads with special serrated claws, a smooth hook and a series of barbed hairs on the end of its legs. Then it combs the threads over the tiny hairs located in his hind legs to give them electrostatic charge. The spider does not coat the frame and radius threads with sticky material until completing its structure. Cleverly the spider can then use the non-sticky radius threads, for movement round the web, and a sticky spiral for catching bugs. 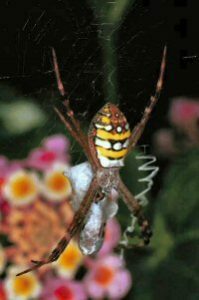 Then the spider sits still and monitors the radius threads for vibrations of an insect getting caught. These web spinning spiders have an innate ability to tell the difference between vibrations from an insect prey and vibrations from other sources such as leaves, twigs falling into the web. Some species are so clever they can distinguish the characteristic vibrations of a dangerous insect such as a wasp. The next morning I checked on the spider web. It was just glittering with dew like diamonds, the early morning sun turning it into such beauty, and the little spider had caught himself a couple of meals. I feel so privileged to watch the magnificent work of God’s creation and the perfection of this insect. And what a lesson it is to us to watch a spider build his business in such a way. You see the amazing web provides food and a place to live. They are truly entrepreneurial little insects.This amazing blueprint design is in the DNA of the spider. 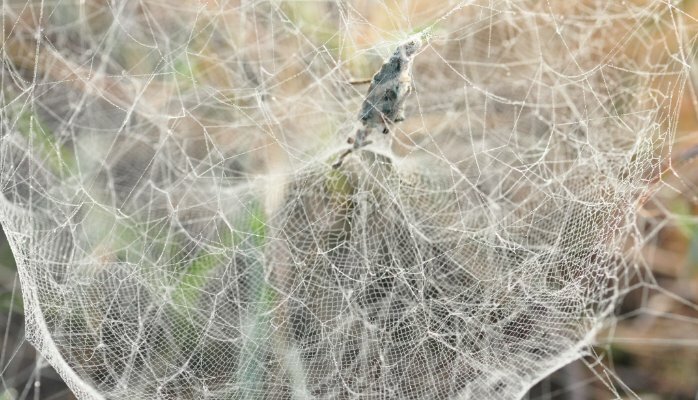 So ingenious and amazing is the work of web building spiders that scientists are now learning from these techniques and methods. 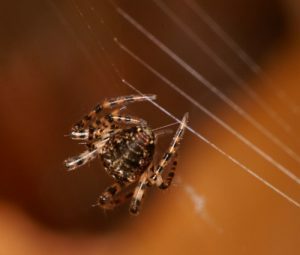 The majority of spider threads are on the micrometer scale, the ability to produce nano-scale fibres has intrigued scientists who are studying the composition of the special silk used by the spiders in construction. It is hoped these studies will assist them in the production of nano-scale filaments which could help scientists develop stronger and more versatile fibres. Today, take some time to think about this little spider. It has an assignment, its hope of the future. With abandon, it launches from the branch not knowing if it will be taken by a bird, caught up by a gust of wind, or miss its landing spot. Perhaps you have the challenge of a new business venture, a new vocation, a special assignment, and afraid to move forward, to take that step and launch out. Nothing will be gained till you venture forward, take the first step, make that phone call. So, who is spinning your web, preparing blue print? We have the blue print, the DNA from heaven, for an assignment from God, the Word of God and the Holy Spirit, the right breeze to carry us forward. Yet so often we struggle and stay firmly on safe ground, our limb of safety, refusing to launch into the unknown. Are you willing to swing out into His atmosphere and find you are firmly attached to Him and he will never let you go? You will not fall into nothingness but right into that place He has called you to. There is risk, but no risk that God will turn up. “For He will give His angels charge concerning you, to guard you in all your ways. They will bear you up in their hands, that you do not strike your foot against a stone.” Psalm 91:12. Note also Proverbs 4:12. Look to the spider and launch out today.